While at my in-laws house last Christmas we had finished opening all the gifts and was cleaning up when my mother in-law interrupted and said she thought that my father in-law had one more gift but it could not be opened until everyone was seated on the couch. So my wife, daughter and son sat down and in came Dad with a 2'x2' box. I had no idea what is inside so thought it would be fun to let the children open it. First there is a small jewelry box with a bead on it. My mother in-law asked me to read it before going any deeper. On the bead it read "DREAMS DO COME TRUE ". Wow! Now I was really lost and not sure what is this all about. Inside was a calendar and a note. The note read that we were all going to Anguilla to help them celebrate their 40th Wedding Anniversary. I was speechless and my son kept saying, "Wa wa wa what?" My wife and daughter were crying. "Thank you so much", was all I could come up with. Dad then entered with the villa info and dates. He also had a printout of the pictures and description of the villa they had rented. We were all just in awe. It has been almost 3 years since we were in Anguilla. Now just counting the days until we are all together sitting on our little piece of heaven enjoying the most beautiful and friendly island in the Caribbean. Nori's Reply: What a happy story! Your parents in-law sure are wonderful to share their special wedding anniversary with the entire family. Christmas in Anguilla is a wonderful time of the year. The temperature is just right and a festive cheer is felt throughout the island. It's a busy time too! You will see plenty of Christmas lights twinkling and restaurants offering Christmas specials. I uploaded a photo of me and my family at Koal Keel during Christmas. 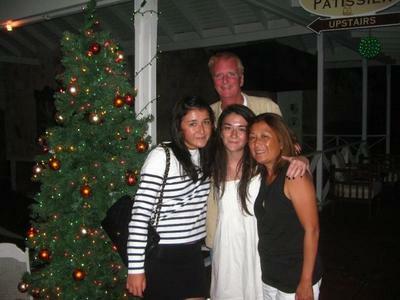 It was our first Christmas in Anguilla. It was sure a special one :-) Koal Keel has a refined quaint feeling to it, perfect for celebrating the holidays. Looking forward to your stories and photos. Have a great time.